09:00 -12:30 with lunch provided. It's a small world. Almost everyone these days uses social media, but are you using social media advertising to its full potential? The potential of platforms like Facebook, Instagram, LinkedIn and Twitter to engage with new customers is endless. This hands on workshop will explain how and why businesses should embrace this technology to create real growth in International markets. From direct sales to brand awareness to lead generation, you will learn how to access new territories and increase sales through some of the most popular platforms around today. 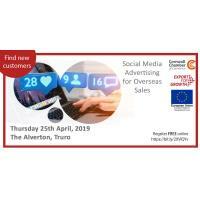 This workshop is for businesses who are brand new to exporting or considering exporting for the first time and want to target overseas customers. It is delivered free of charge to eligible businesses. PLEASE NOTE: Regrettably, we are unable to accept intermediaries or service providers. Spaces are limited, so book early to avoid disappointment!